I live in SoCal, about 20-30 minutes away from "The Happiest Place On Earth", Disneyland. You would think that living so close I would be riding the Matterhorn a few times a month, but no, I usually make the trek to Anaheim on special occasions. One of my favorite things to eat at Disneyland is the Countdown Chicken Fusilli sold at the Pizza Port in Tomorrowland. My friends and I would always order this delicious pasta dish since we'd only make it over to the park a couple times of year. I would actually look forward to going to a theme park specifically to get this for lunch. I had made this once before in high school but my sister has been bugging me to make it for her so I decided to try it again and share it with you all! 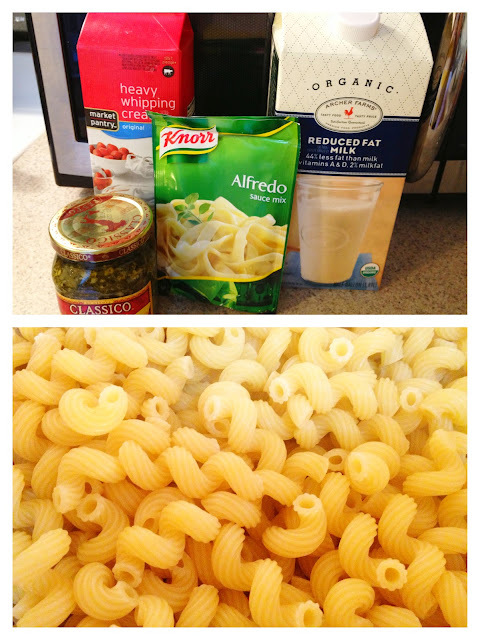 I was an alfredo packet short so I adjusted the liquid measurements but I recommend everyone follow this recipe exactly to get the best results! Prepare Alfredo sauce according to package directions, replacing any liquid the directions call for with the cream, milk and water. Add pesto sauce to Alfredo mixture and mix thoroughly. Heat sauce to a boil them let simmer, whisking occasionally. The sauce will thicken up as it cooks. Cook pasta until al dante. Drain well, the pasta is all twirly so shake the colander a few times to get all the water out. Return drained pasta into pot. Add sauce and chicken to pasta and mix well. Top with sun dried tomatoes and parmesan cheese. Serves 4-6 people. Chicken fusilli is my favorite food to eat in all the recipes that are ever being introduced. I have been making it with the same recipe that you have got here in this article for everyone else. This recipe is so mouth watering that I would love to have it right now because I am really feeling hungry. It sure seems to be easy to be made at home with more ketchup. You have reminded me the days of my childhood life which has been the most exciting days of my life. It sure has been a great book to read for every person that want to get some quality time.